People also loved the Virginia Senator’s Donald Trump impersonation. Hillary Clinton's running mate, Virginia Senator Tim Kaine, for all intents and purposes, introduced himself to the American people on Wednesday night at the Democratic National Convention. Kaine described his upbringing in Kansas as the son of a welder and teacher and his road into politics. The Senator also spoke of his son - who he said deployed "to protect and defend the very NATO allies that Donald Trump says he now wants to abandon" - before accepting the nomination as the Vice President of the Democratic party. Kaine's Spanish fluency featured prominently in his speech, as he called Clinton his, "compañero de alma." Kaine appealed to Bernie Sanders and his supporters, welcoming them into the fight against the Republicans in November. 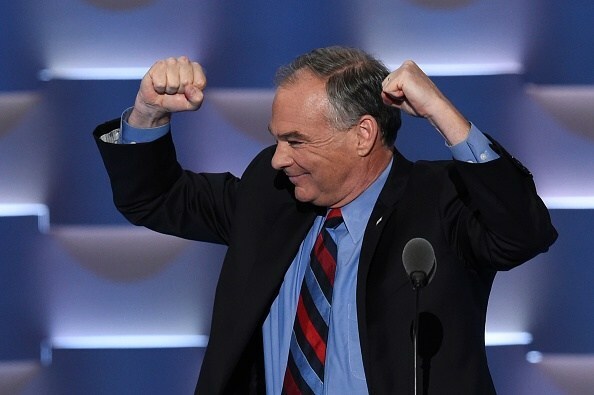 The internet took to Kaine's familiarity, anointing him the "King of #dadtwitter."